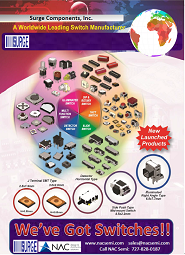 Surge is a highly competitive supplier of capacitors and discrete semiconductors with manufacturing facilities and sales offices located worldwide. The company is a progressive organization known for its wide product selection, outstanding service record and aggressive pricing. Surge's product offering encompasses Aluminum Electrolytic, Film, and Multilayer Ceramic Capacitors in SMD, radial and axial packages. Surge's discrete products include Bridge Rectifiers, Diodes, and Transient Voltage Suppressors. Surge is the North American marketing office for Lelon Electronics. As a world class manufacturer of the Aluminum Electrolytic Capacitors, Lelon boasts the largest production capacity outside of Japan, nearly 1 billion pieces per month. Our QS9000/ISO9001 certified system ensures the highest quality at very competitive price levels. With a global logistics strategy, Surge/Lelon is well positioned to service customers anywhere in the world.